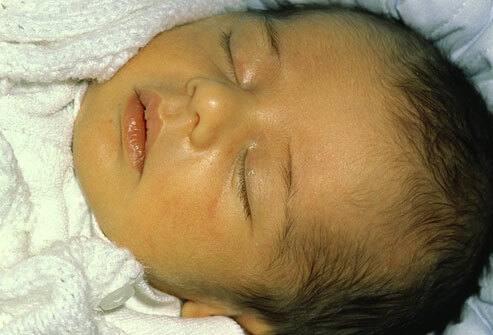 Many newborn babies develop jaundice, also known as hyperbilirubinemia. This usually happens within two to four days after birth as a result of high bilirubin levels. Bilirubin is a waste material which results from breakdown of blood cells. The liver of a more mature individual has the ability to filter out bilirubin and eliminate it from the body. However, a newborn’s liver has not developed enough to deal with the bilrubin. But, is there a way to prevent jaundice in newborns? Some blood incompatibilities cause breakdown of higher amounts of blood cells, which leads to high levels of bilirubin. Expectant mothers with blood group O+ or rhesus negative blood type should get additional blood tests carried out because A, B, O incompatibility and rhesus incompatibility are high risk factors. Genetic enzyme deficiencies such as glucose-6-phosphate dehydrogenase deficiency, may increase the risk of jaundice due to destruction of some blood cells and the resultant increased bilirubin. Besides the normal blood tests during pregnancy, most doctors order for routine testing of newborn babies for jaundice. Decreasing the risk of preterm delivery is one way how to prevent jaundice in newborns. Preterm babies born before 38 weeks are more likely to develop jaundice because its liver is not fully developed when compared to a baby born after the 38th week. While it is not possible to change preterm risk factors like multiple births and age, it is possible to change many environmental factors. Follow the recommended prenatal care right from the early stages of your pregnancy so that your growing baby is healthy. Prenatal care ensures that any problem is identified and dealt with so that you carry your baby to term. Keep away from chemical contaminants such as alcohol, tobacco and other street drugs as well as some medications and environmental pollutants as these may increase your risk of preterm delivery. Remain calm and keep away from stress as much as possible because stress can lead to preterm births. Seek social support and avoid emotionally or physically demanding activities as these may also lead to premature birth. Infections like syphilis, herpes, toxoplasmosis and CMV can lead to premature birth and even jaundice. As a way how to prevent jaundice in newborns, pregnant women should undergo monitoring to reduce the risk of such infections. Ensure that your baby gets adequate nutrition by feeding on breast milk for 8-12 times daily, especially in the first days of the jaundice. This way, your baby also gets adequate hydration such that the waste is eliminated from the body quickly. In case you do not breastfeed but feed your baby on baby formula, ensure that she takes 1-2 ounces of the formula feed every 2-3 hours in the first week.Note that smaller and preterm babies will normally take less formula feed. The same is true for a baby who is also given breast milk. Consult your baby’s doctor if you think that your baby is taking more or less formula than normal. In the event that your ways how to prevent jaundice in newborns were unsuccessful, the obvious symptom of jaundice is the appearance of yellowing of the whites of the infant’s eyes and skin. This will usually appear 2-4 days since birth. Check if your baby has jaundice by gently pressing his nose or forehead. Appearance of yellow color on the pressed part of skin indicates the presence of jaundice. In case of absence of jaundice, pressing your baby’s skin will only cause it to appear a little lighter. For reliable results, carry out the test in natural daylight or in a well lit place. Your baby will normally be examined for jaundice prior to discharge as per recommendations of The American Academy of Pediatrics. Examination is also carried out during normal medical checks as well as once every 8-12 hours during hospital stay. It is also necessary for your baby to be examined for jaundice between 3-7 days since birth since bilirubin levels are usually highest in this period. In case of discharge before 72 hours after birth, ensure that you take him back for examination for jaundice within two days following discharge. Baby seems sick, listless or hard to awaken. Baby is feeding poorly or not gaining weight. Baby cries in a high-pitched tone. You observe some signs that cause concern. Your baby’s jaundice remains for three weeks or longer. Most cases of mild jaundice resolve on their own as the baby’s liver matures. For faster recovery, ensure that you feed the baby 8-12 times daily. This helps the baby’s system to eliminate the bilirubin. These include phototherapy; an effective treatment method using light to break down the bilirubin in the baby’s body. The baby is placed under blue spectrum light while only wearing diapers and protective goggles with a fiber-optic blanket underneath. Some types of jaundice are related to differences in the blood groups between the mother and her baby. The baby carries some antibodies from her mother which cause breakdown of the baby’s blood cells. In such a case, the baby may be given an intravenous immunoglobulin transfusion of a blood protein to reduce the level of the antibodies. This can help decrease the jaundice and reduce need for exchange blood transfusion. In case your methods to prevent jaundice in newborns did not work and very severe jaundice develops, an exchange transfusion may be carried out. In this procedure, the baby is transfused with a small amount of blood to replace his damaged blood with healthy blood. This procedure decreases the baby’s bilirubin levels and raises his red blood cell count.